A reflex bow. 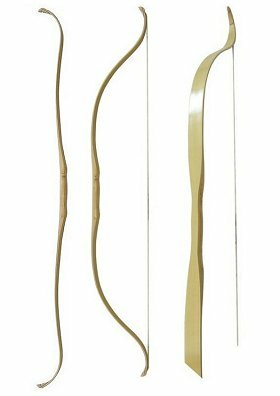 Tightened shoulders of the reflex bow make after putting a bow-string its characteristic shape. This construction is known for many centuries and it was abundantly used by Asian nations. Some materials of its traditional construction ( horn,sinew) are replaced by laminated lamellas.These lamellas arrange power and flexibility of the bow according to your needs. Its priority are in its power characters. The bow centre is strengthen by a wooden handle. The ends of its shoulders are provided with shaped notches for anchorage of a bow-string or wooden anchors of the bow-string. The bow is painted. A horn tuck for an arrow and a handle covered by leather are provided, delivered above standart offer This bow is for adults and youth.